Quick overview Aimed at anyone who would like to be able to pick up a pencil and just draw, this book provides a foolproof way to pick up the skills - and most importantly the confidence - to sketch and experiment without the hang-ups and inhibitions that can all too often get in the way of our creativity. 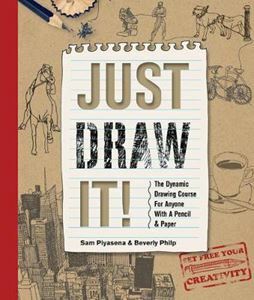 The drawing course that sets free your creativity Aimed at anyone who would like to be able to pick up a pencil and just draw, this book provides a foolproof way to pick up the skills - and most importantly the confidence - to sketch and experiment without the hang-ups and inhibitions that can all too often get in the way of our creativity. Just Draw It! is suitable for anyone, from self-styled artistic no-hopers to aspiring artists who want to get new ideas and skills. It is organized as a series of exercises, all of which will provide you with essential practice for your brain, eye, and hand - from trying out rapid-fire sketches of moving objects, to detailed observation of tones and contrast, to capturing the mood of a scene, or looking at its structure through the formal rules of perspective. The result is a deceptively powerful drawing course that does not feel like a course, designed to conquer your inhibitions and develop a love of drawing and sketching that lasts a lifetime.